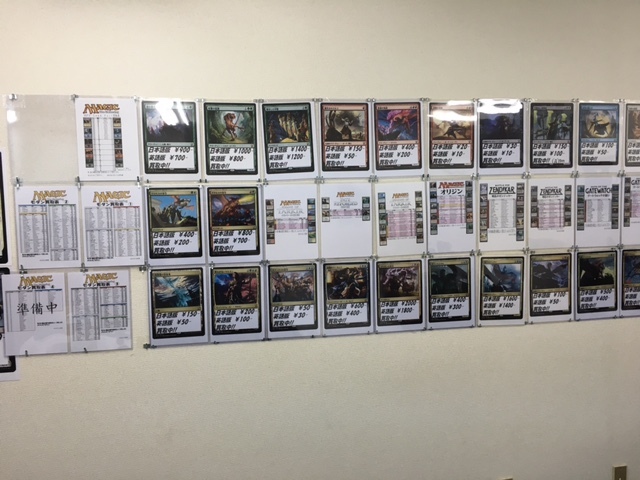 With Grand Prix Tokyo just a few days away, I think now is a good time to post up the rest of the information I collected last time I was in Tokyo about MTG stores in the area. While this is yet to be a definitive list (doing all of Tokyo would take weeks), it should cover the major areas of MTG in the city. I’m sure I’m missing some places in Shinjuku and a quite a few more in Akiba, but this is a pretty good start. Today I’ll be starting off with Tokyo MTG, home of Kai Sawatari (Top 8 of GP Kyoto 2015, Legacy), as well as one of the only MTG stores in Japan owned by English speaking and foreign born players (Heiko Schmidt and Brent Boehner). The physical store has been around for a more than a year now, but the company has been around much longer than that as an online store. I was lucky enough to have met both Heiko and Brent a few years back thanks to my blog, and have gotten to know them better over the last few years through Facebook and Grand Prix. I had been meaning to check out their actual location in Suidobashi in Tokyo for the LONGEST time, but every time I found myself in the Tokyo area I didn’t have the time to do so. Thankfully, last time I went to Tokyo I was able to check it out. Sadly I wasn’t able to chat with either Brent or Heiko, but they did give me the go ahead to snap some pictures and write an article about the store. 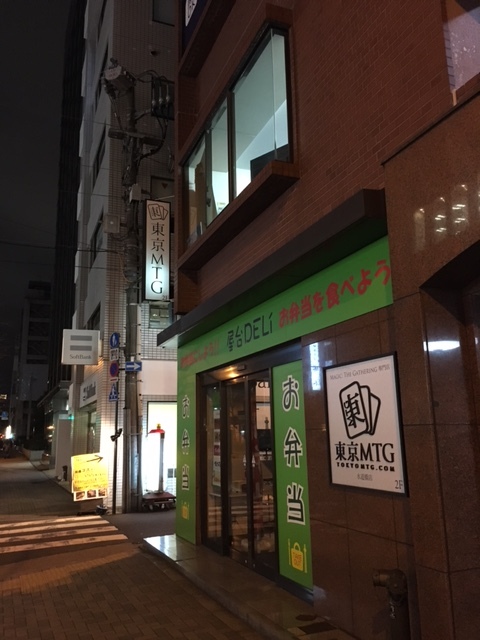 Tokyo MTG is a relative newcomer to the MTG scene in Japan and doesn’t have the nationwide presence of some of the other stores, or a giant mega store located on the other side of town. 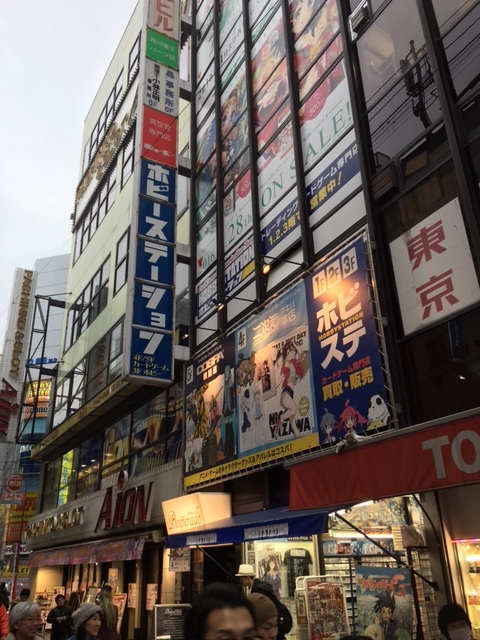 However, they are in a good location and just a stones throw away from Akihabara. The store is located closer to Suidobashi station on the JR Chuo line than I thought it would be, and only took a few minutes to walk there on foot. Our store is conveniently located to the south side of Tokyo Dome, only a two minute walk away from JR Suidobashi station. There is a large variety of train lines and stations you can use to get to our store, including the JR Chuo line, one of Tokyo’s busiest and most important lines. Suidobashi is only two stations away from popular cultural hub Akihabara, and only seven stops from Shinjuku station, one of Tokyo’s most important city centers. The JR Chuo line to Suidobashi station is the easiest way to get to the store. Exit JR Suidobashi station through the west exit, and walk down the main road towards south, you will find us on the right side of the street, next to the bright yellow sign of Gogo Curry next door. Suidobashi also has a subway station, which is slightly further away, but still only about a 5 minute walk. When arriving by Mita line on the Toei subway system, take the A2 exit, then walk west until you reach the pedestrian bridge. Turn left at that crossing and follow the street south. You will find soon us on the right side of the street, next to the bright yellow sign of Gogo Curry next door. Iidabashi on the Metro subway Tozai, Yurakucho or Nanboku line, or the Toei subway Oedo line. Kudanshita on the Metro subway Tozai or Hanzomon line, or the Toei subway Shinjuku line. Jinbocho on the Toei subway Mita or Shinjuku line, or the Metro subway Hanzomon line. From all of these stations, it’s about a 10 minute walk to the store, and we recommend using some kind of navigation like Google Maps to find your way. Located on a large street, it’s relatively easy to find. As you can see in my picture, it’s located above a bento (lunchbox) store which is pretty convenient if you get hungry. The store is also located near Tokyo Dome, where the Youmuri Giants baseball team plays. If you’re in the area to see a game, or to see a music event at the dome in the baseball off season, it’s a great place to stop in and check out for an hour or two if you have time before/after the event. After a short climb up the stairs, you’ll find the door to Tokyo MTG and the front desk. 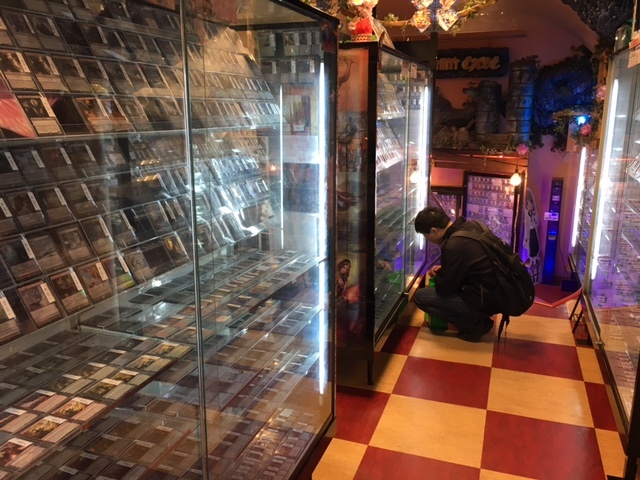 At the front deck you can find sealed product (old and new), priced to move eternal singles for Vintage and Legacy, various playmats, and far off to the right they also have a convenient refrigerator filled with drinks. On the left side of the entrance there are some computers set up to help you search for any single cards in both Japanese and English (a plus since many stores are only in Japanese), and there is also a relaxation area next to the front desk with couches and a table where you can sit down and watch MTG TV such as Pro Tours, Grand Prix, etc. As far as playing areas go, you won’t find this much play space devoted solely to Magic the Gathering anywhere else around the city (outside of Hareruya’s tournament center that sits 200+). Most tournament spaces around Tokyo fit 20-30 players comfortably, but Tokyo MTG can fit close to 60. This is a great place for PPTQs, pre-releases, and bring a group of friends to play cube or draft. 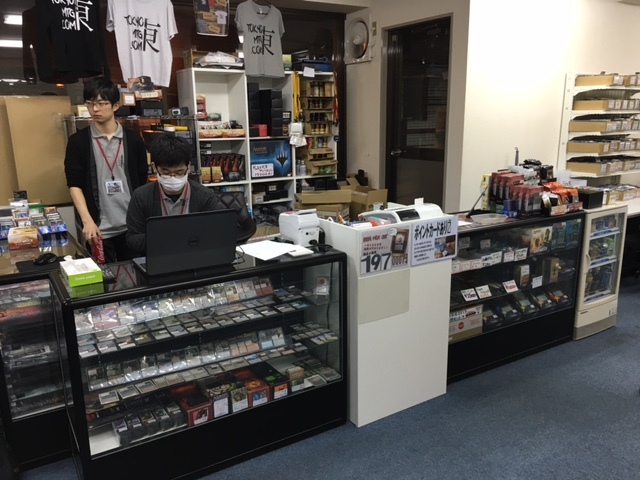 The store is clean and bright we well, leading to an overall comfortable playing experience. 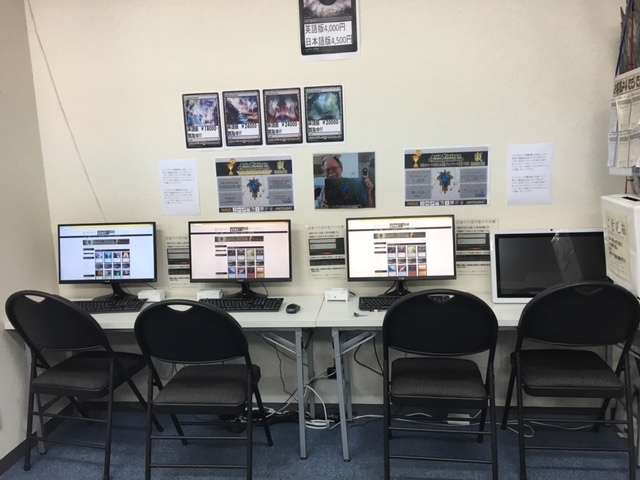 As you can also see to the left of this picture, there are boxes and boxes of bulk cards to look through, so feel free to grab a chair and browse. 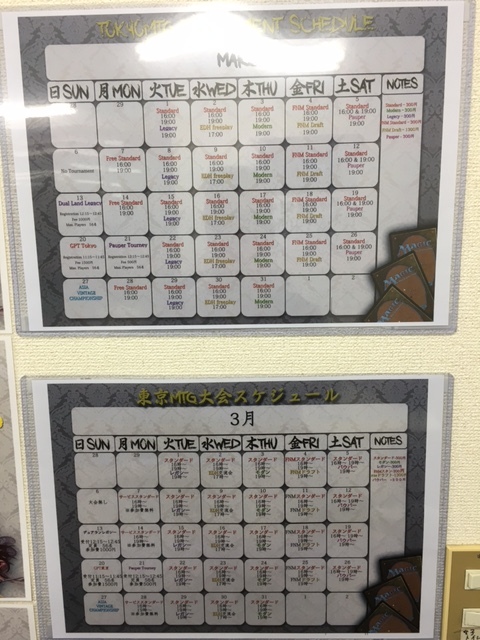 Another great thing about Tokyo MTG is their tournament schedule. It’s jammed pack with tournaments and a grinder’s dream. If you don’t have access to MTGO (or the digitial cards you need), you can play here every day of the week. Standard is represented the most, but you can also play Legacy, Modern, do draft, EDH, and even Pauper (one of my new personal favorite formats). With most of the other stores around Tokyo you’re lucky to get 2, maybe 3 MTG tournaments a week (and most of the time they are standard). While I’m able to play MTG almost every day here in Nagoya, I must travel around town to do so, with the tournaments sometimes being more of pain to get to than makes them worth it. If I could play in an 8-man+ standard tournament every day leading up to a GPT, PPTQ, or Grand Prix in the same place, I’d be pretty happy. Only 300 yen a tournament too it seems. Tokyo MTG also has some of the best buy prices around town. They are highly competitive and give top dollar for staples. While these picture are dated, I can tell you that you would be hard pressed to find buy list prices as good as these. In Nagoya, the buy list prices are usually $2-3 less than what you can sell them for at Tokyo MTG. Feel free to check out other stores in Akihabara to see what they are buying cards at, but I think 70-80% of the time you’ll find better buy prices here. Next time I’m in town I’m definitely considering dropping by and selling a few cards. 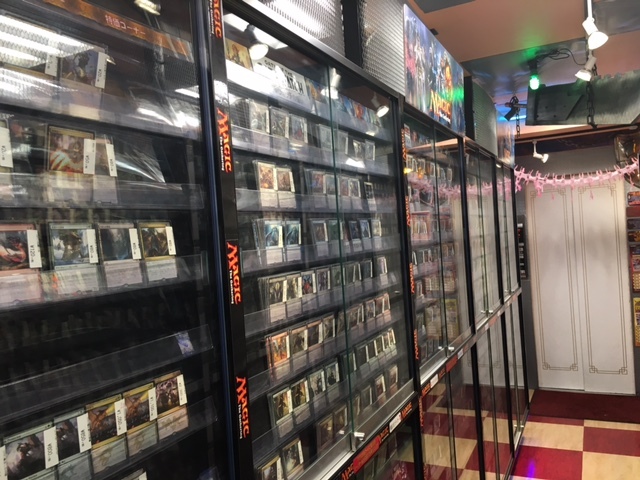 Tokyo MTG isn’t close to dozens of other stores and doesn’t have giant card cases spread as far as the eye can see, but it’s definitely worth the visit if you’re in the Tokyo area. 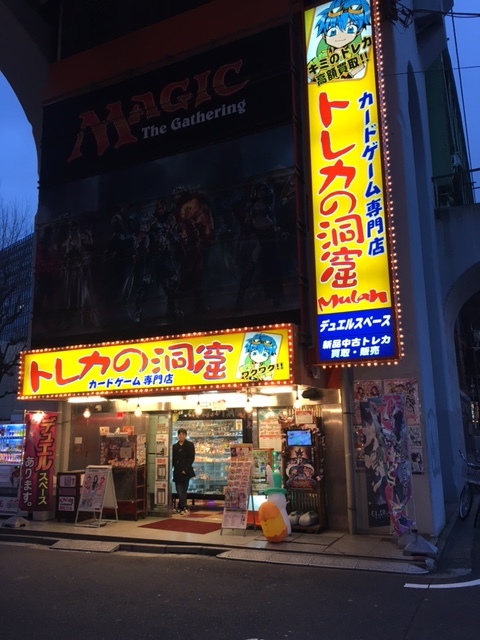 They have both English and Japanese speaking staff available, have good buy prices, and their main focus seems to be about being a store where players can play Magic and be comfortable doing so. 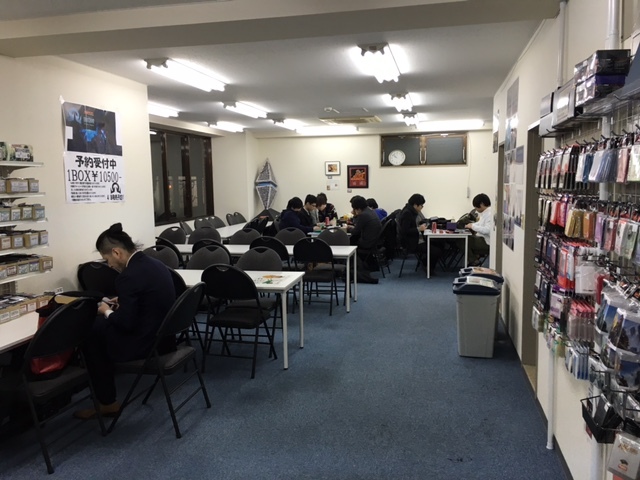 If you want to sell your cards (or buy some at competitive prices), or you just want to sit down and play some games with friends and not have to deal with all the noise of Ikebukuro or Akihabara, Tokyo MTG is the place for you. When we last left Akihabara MTG stores, we had explored the Radio Kaikan building near the Electric Town exit of Akihabara station. Our next destination just off the main road near the station. It’s pretty easy to get to the main road from the station. You should be able to see it down the road about one block from the entrance. 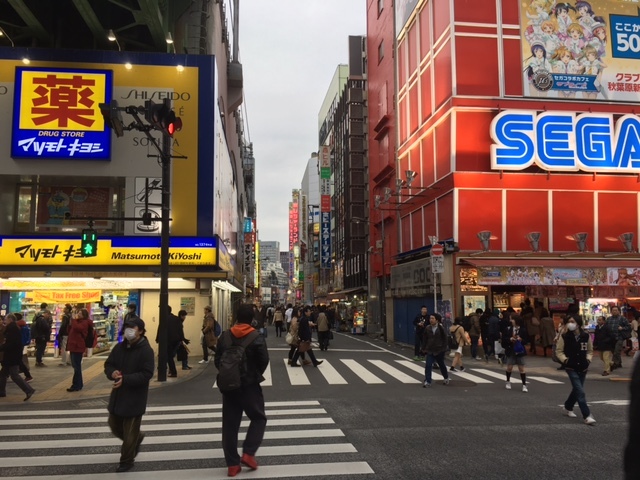 As you can see in the picture, once you reach the main street you’ll see a large Sega video game arcade as well as a Matsumoto Kiyoshi. Not easy to miss. Our first stop in Akiba is Hobby Station, which, if you look directly at the middle of the above picture you can see their blue, vertical sign. Yes there was a Hobby Station in the Radio Kaikan building, and YES you should check this store out as well. If there is one thing I learned while living in Nagoya it’s that each store is their own ecosystem. Nagoya has 3 Hobby Stations in the downtown area yet their selection, prices, and buy lists are all different. Another reason for visiting this Hobby Station is that you can actually sit down and play some MTG while you’re visiting it. The one in Radio Kaikan didn’t have a play space I believe because it was on the 1st floor. The most interesting thing about this store is that there are a total of 5 floors. The first two floors are full of other TCGs and accessories, and on the 3rd floor you’ll find all of their Magic cards. 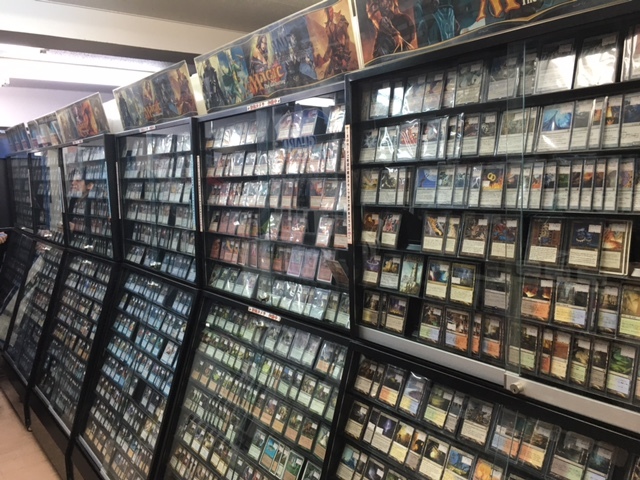 They have a pretty large selection (more than what the Radio Kaikan store had), and you can find something from almost ever format (legacy, EDH, modern, etc). The best prices you’ll find will be on casual and EDH cards, but sometimes you’ll find others for a pretty good deal. There are a few boxes of bulk near the register to check out as too. There are also good buy prices at Hobby Station from time to time, but it seemed like they didn’t update their prices too often which is unfortunate. The store has a decent amount of single cards to browse in both their cases and boxes, and with 5 floors you can probably find some playing place here more easily than you can at any play in Radio Kaikan. Nice place to check out if you’re comparing prices and want to get a game or two in with friends. Akiba is a busy place though, so don’t always expect to find an open table. 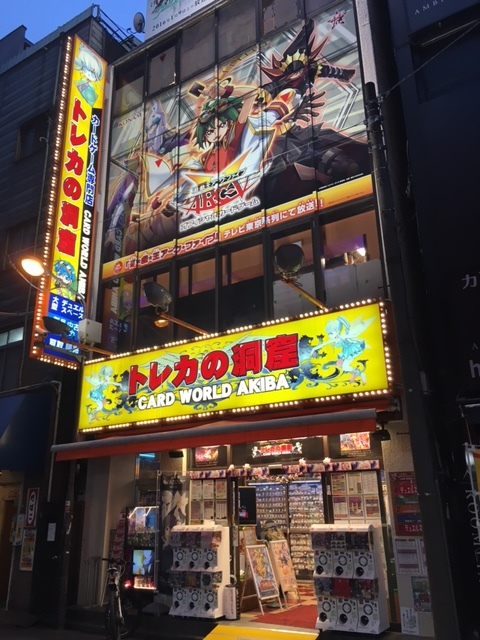 Back out side and not too far down the road and just around the corner from Hobby Station on the left you’ll find Card World Akiba. This store is 4 floors tall and jammed packed with trading cards from various games. There are also 2 playing spaces inside that hold about 40 players. One is in the basement, and the other is on the 4th floor. They were packed when I went there, but that was on the weekend so it’s to be expected. The selection of MTG cards at Card World Akiba was rather disappointing. Although they had 4 floors of cards and dozens of card cases, they only had a small area on the 3rd floor devoted to Magic the Gathering. The selection of cards only stretched back as far as the Kahns of Tarkir block which makes me think that they only recently got into selling MTG cards and holding events there (which are mostly standard). You’d also be hard pressed to find a fellow MTG player at this place when there isn’t a tournament that day. If you’re looking for standard stuff and want to compare prices its worth a few minutes to check them out, but otherwise I would say don’t waste too much time at this store. Maybe it will have a bigger MTG presence in the future, but until then skip it. The last place I went to on my short visit to Akihabara in Tokyo was Toreka Doukutsu Mulan. It’s located straight down the road from Hobby Station and it situated underneath the train tracks. There are actually 2 “Mulan” shops in the same area, but this is the one you want to check out if you are looking for Magic cards. Just like the other stores I’ve talked about so far, it’s also 4 floors, which means there is lots of stuff to look through inside. Of course you’ll find various other TCGs at the store as you will almost anywhere in Japan, but if you want MTG go to the second floor. The design of the store is a little eclectic, with various fantasy themes and items located around the store (see the ancient pillars in the background of this picture), but it’s kind of endearing. Most places in Japan tend to be rather bland and boring but at least they are trying to create a fantasy environment at Mulan. The Magic card selection is actually pretty good at this place. Their prices aren’t amazing, but you’ll find a decent amount of cards from all formats, a nice collection of foils, and quite a few MTG players here as well. I saw quite a few people playing Magic while I was visiting the store in both of their play areas. They have a duel space for 30 people on the 3rd floor, and another one for about 24 people on the 4th floor. It’s worth a stop. Being farther from the station means that you’ll find more open tables here from time to time, and the amount of cards they have assures that there is a good chance you’ll find the card you’re looking for here. Their buy prices were so so, but Toreka Doukutsu’s card prices were pretty standard. You won’t pay more or less than you would at a Hobby Station probably, but it would definitely be cheaper than a place like Yellow Submarine or Big Magic most of the time. I’m still far from finished finding all of the MTG shops in Tokyo. Akihabara still has dozens more scattered around the area, and I haven’t even touched places like Shinjuku which I know have a few. It’s going to take me more than a few trips to get the majority of them all, but when I do you’ll be able to see just how large and sprawling Tokyo is and how many Magic the Gathering players it supports. For those of you that live in the area, I welcome any kind of input or feedback about these stores that I might have missed being only a visitor. I would really appreciate it if you could please leave your comments or information down below regarding the Akihabara area. Thankfully I got this done before Grand Prix Tokyo this weekend, so I hope those of you visiting the area can check out some of these stores the following week after the event is over. Happy travels and I hope you can find some good deals here in Japan! Dude. Post the address. Please. For gods sake, we need the adress to mark these in google maps. Please. I’ve linked to some of the stores’ websites, so you can get the addresses/directions from there, but I don’t have time at the moment to post all of the stores addresses (especially those that I don’t live near). I’ll try to do it in the future, but can’t help you out right now. I’ve always had a problem putting Japanese addresses into Google Maps myself, so I never use it. Thanks for the guide, all quite easy to find with a little google maps help.